Mehdi Karroubi, one of the opposition leaders of Iran’s Green Movement who has been under house arrest since 2010 is now refusing food in protest to the conditions of his arrest. 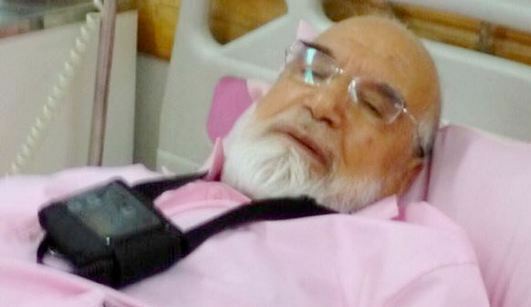 Karoubi decided to go on hunger strike to demand a public trial; he is also asking security forces that are living with him and monitoring his every move while under house arrest to leave him alone. His wife, Fatemeh Karroubi told SahmaNews that her ailing 80-year-old husband cannot take the conditions of house arrest anymore and has gone on hunger strike as of dawn 16 Aug 2017, when he woke up to pray. Karoubi, a senior cleric amongst the reformists, underwent heart surgery last month. He suffers from heart arrhythmia and is now living with pacemaker implant. “Mr. Karroubi has clearly stated his demands. First he demands that all security officers be removed from his home. Such situation is completely unprecedented in any house arrest either before or after the (1979) Revolution, for officers to live in the house of the confined individual putting their every word and movement under surveillance and making life impossible for them and their family members.” Fatemeh Karroubi stated. According to his wife, Mr. Karoubi is demanding an end to his extrajudicial house arrest and is asking for a public trial, a demand that he has put forward many times since his arrest. In a public letter to President Hassan Rouhani in 2016, Karoubi asked “the despotic regime” to grant him a public trial so that he can defend himself. Karoubi, Mousavi and Rahnavard have never been formally charged with any offence. Iranian officials have said that the Supreme Leader, Ayatollah Ali Khamenei, who has the final say in major state affairs, ordered the house arrest and the arrests are extralegal but “justified” under his authority. While Karroubi and Mousavi have never been formally charged, they have been implicitly accused of sedition by the ultra conservative factions of the Islamic Republic. Mehdi Karroubi in hospital, July 2017. In the 2013 presidential elections, President Rouhani had run on a platform of ending the house arrests of the opposition leaders but he has not been able to realize his promise so far. The former parliament speaker, Karoubi opposed Mahmoud Ahmadinejad during the disputed 2009 presidential election. He was a candidate in 2009 and from 2009 to 2011 he was a leader of the Green Movement of Iran along with fellow reformist Mirhossein Mousavi and his wife Zahra Rahnavard. Three of them were detained and remain on house arrest as of February 2010. Mehdi Karroubi and MirHosein Mousavi, the two moderate candidates running against Mahmoud Ahmadinejad in 2008 presidential elections, challenged the vote count which claimed Ahmadinejad as the winner of the race. The challenge led to months of streets demonstrations which the establishment chose to put down violently with widespread arrests and attacks on demonstrators. Scores were killed and thousands received heavy prison terms. Iran’s Supreme Leader Ayatollah Kahemnei refused to accept the challenge against the vote count and the two leaders were finally put under house arrest without any formal charges being brought against them. 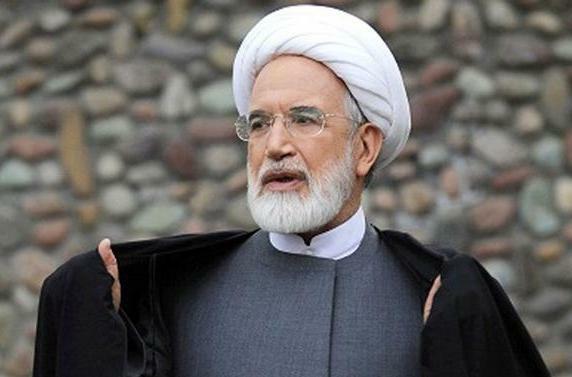 Mehdi Karroubi was recently treated for heart complications. His wife told Saham News that since this morning he has only taken his heart medication. She added that the situation with the security officers in their home has become intolerable for her husband and that he has only taken the heart medication today under insistence from her and the attending physician provided by the Ministry of Intelligence. MirHosein Mousavi and his wife Zahra Rahnavard have also been living under house arrest and while there has been continued concern about their health, they are practically cut off from the outside world.